I remember their first 7Inch which I posted on my old blog and since then this great band has been forgotten until I was asked for this compilation which was published by Only Fit For The Bin Records in an edition of 200 copies only as CD six years ago. Twelve rare goodies, the pieces of their singles + unreleased demos & live material and an radio interview from 1977. 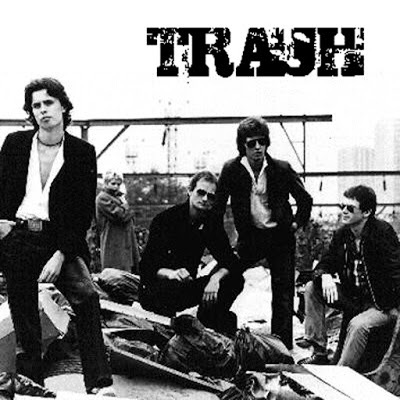 Trash formed 1976 in Weybridge/Surrey and signed to Polydor (!) and released two singles. Auditioned in front of Roger Daltrey and John Entwistle for the role as a mod group in the film ‘Quadrophenia’, but didn’t get the part. Trash split in 1979. Not much on compilations represent but the detectives immortalized them on Killed By Death #F.U.2 and Killed By Death #24. Enjoy the dirty sound of Trash and have always a smile ready.